I went to the dog run today to see if this pit bull would be there with the ASPCA. 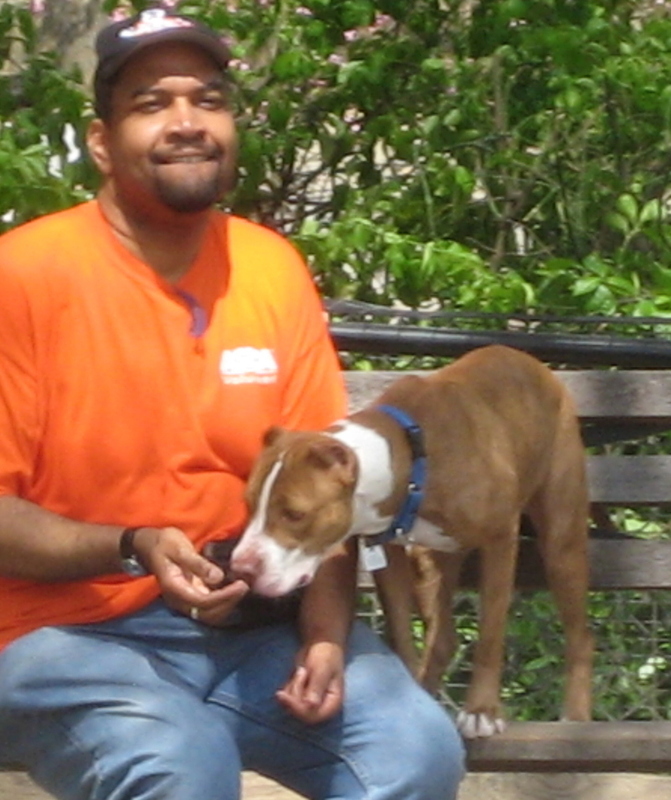 Remember the ASPCA brings their dogs to the run on Wednesday afternoons. I just knew she would be. That's right, she. Her name is Cali. I had a nice conversation with her handler. The best thing he told me is that the ASPCA is a no kill shelter! I did not think it was. So Cali is safe until someone adopts her. This man, whose name I did not get, said they have about 100 dogs in the shelter and 10 to 15 are adopted each day. I would never have guessed that many dogs would be adopted daily from one shelter. As I just told Michele, I have always known if I ever adopt a dog it would be one on the verge of death. One in danger of being euthanized. The ugliest dog I could find. That is why before I got Dudley I came close to adopting a badly lame little pit bull from the Center for Animal Care and Control. I figured nobody wants a lame dog. Unfortunately she turned out to be a bit crazy. But I am going to start frequenting the CACC so I can publicize their dogs. Unfortunately the dogs at the center are on a very fast rotation. It may be as short as 48 or 72 hours before they are euthanized. I will find out.